In order to use Photoshop to make text stand out effectively YOU MUST understand how layers work. I wrote a post about how I Cartooned myself, which includes an explanation of layers. Would recommend looking at the layers part if you don’t know what layers are. There is actually ONLY ONE WAY to make text stand out on any photo or graphic design. So we’ll start with that and add to your toolbox until we’ve given you 4 ways. 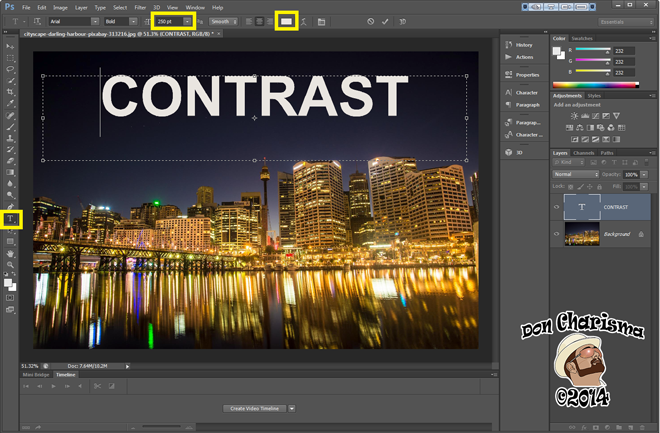 From this you can build combinations and easily master making text stand out using Photoshop. DO have patience with Photoshop – it’s an incredibly powerful tool. The downside of having that much power is that it sometimes seems very complex. Persistence and patience will pay off I can promise you that. These examples are designed to build your knowledge, so please start at the beginning and work your way through – there is an order of learning that will help you 😀 Or in other words skipping a step will slow down your learning, or you won’t learn anything. Sponsor message – IF you’d like a web designer to help you with your project – please contact us DonCharisma.com we’re pleased to help on commercial projects of any size. Virtually all methods of making text stand out using Photoshop (or any other Photo/Design software), are levering the same principle – contrast. We all understand contrast, whether knowingly or not. Without it we wouldn’t be able to read or write. These are both examples of contrast being leveraged to make text stand out. The same principle applies in Photoshop. So how do we do it in Photoshop ? Use the text tool on the tools panel (left hand side) to draw a text box. Use the character bar (top) to change Font/Size/Colour – Mine is Arial Bold 250pt White. Please note for large text sizes you may need to type the size in the box ! Another very simple technique for making text stand out is to put a “stroke” around the text. 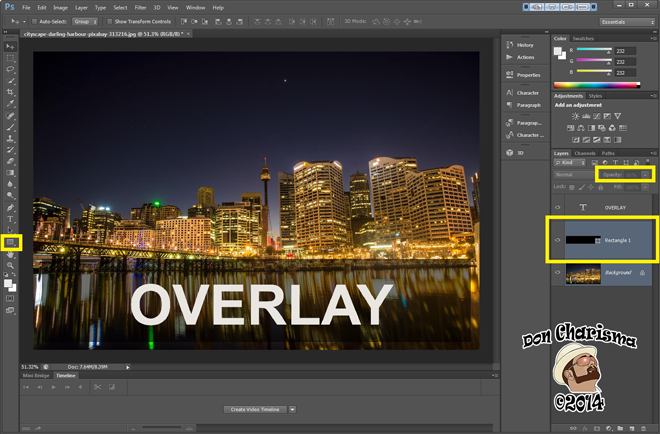 There’s a special panel in Photoshop called the “Layer effects and styles” panel. Adobe have help on it here. Let’s call it “the effects panel” for short. How I usually access this panel is to create the text box first, type my text and then double click just to the right of the layer name in the layers panel. Don’t worry if you didn’t get that I’ll highlight the exact place in my example. 1. As you did in the example above, create text box with text you want to highlight. 2. Double click just the right of the layer name to bring up the effects panel. 3. Click on the “Stroke” style and adjust the size to suit. In my example it’s a basic black stroke 10pt. The problem that is without doing something with the text it tends to blend with what’s behind. So adding a stroke here, will make it stand out. This is a very commonly used technique to alter what’s behind the text in order to increase the contrast. Commonly used overlays are black and white (text in the opposing colour). Create text box with text the size and colour you desire. I will continue with white text to keep it simple. Drag and drop the rectangle’s layer, so that it appears behind the text. It should be between the text layer and the background layer. Adjust the “opacity” of the rectangle layer to around 50% ish. I’ve highlighted where the shape tool is (left hand side) for drawing the rectangle. Also the position of my rectangle layer between the text layer and the background layer (right hand side). And lastly the opacity box to change opacity to around 50%, in this case it’s 56%. This is a neat effect, can lend a “3D” feel to the text popping up from the photo. Basically we’re putting what looks like a shadow behind the letters. Create a text box – to your desired size, colour and font as you’ve done in the other examples. Double click on the text layer to bring up the effects panel. 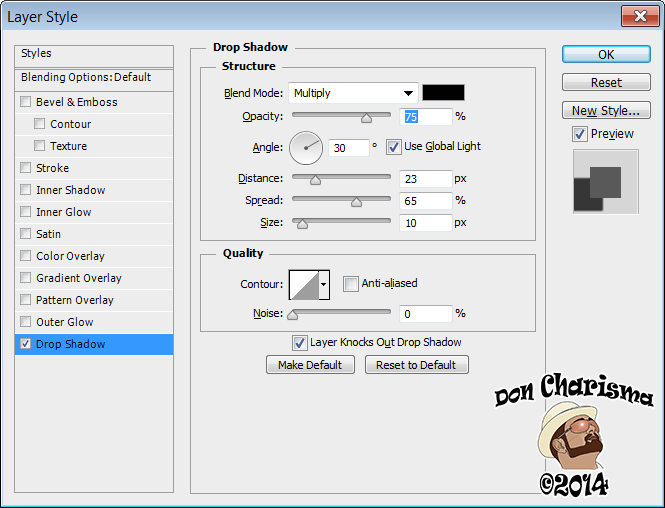 Navigate to “Drop Shadow” and adjust the sliders for “Distance”, “Spread” and “Size”. Mine are 23, 65 and 10 respectively in this example. The rest of the settings are the defaults. Contrast is the main tool used to make text stand out on a photo or graphic design, using Photoshop (or any other graphics package). 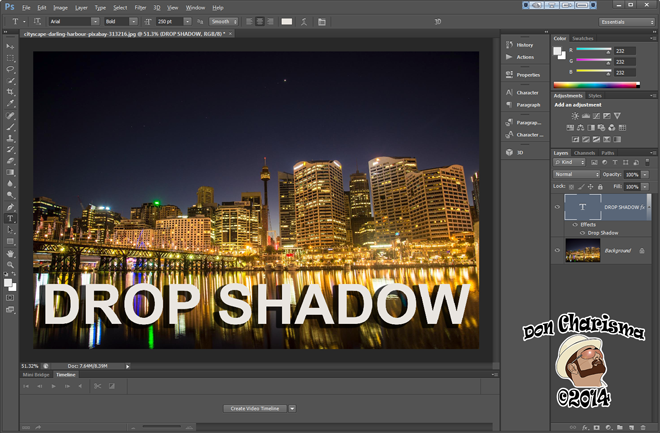 I’ve explained the techniques of basic contrast, stroke, overlay and drop shadow. These techniques can be built upon (and combined) to form more sophisticated methods of making text stand out. Sponsor message – At DonCharisma.com we have all the skills to put together outstanding web sites of any size for any purpose. Please contact us if you have a commercial project. Experiment with the use of colour for text, strokes, overlays and drop shadows. High contrast are things like black/white and red/yellow, but there are obviously more subtle contrasts for subtler effects. Red/yellow is often used for instance in before and after photos. Happy Photoshop’ing … as a bonus, if you want to share links here to your creations, then I’d love to see what you come up with ! The entire photo has a black overlay to make the metallic writing stand out. 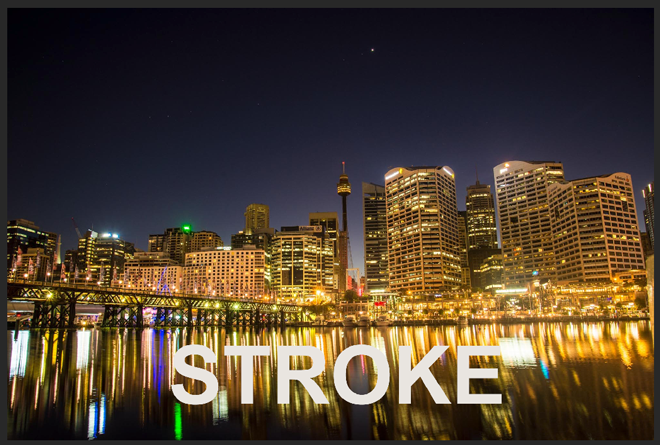 Stroke used on main text. Outer glow (similar to drop shadow) used for superman badge. Stroke used on lettering with high contrast colours. Logo has an outer glow. The entire image uses a white overlay. The text has a black stroke. Same for the following six which were all created for our commercial site. Here (from memory) I used embossing with a drop shadow. Again embossing with a drop shadow that makes the text appear to be “floating above” the photo. It s always a lot of fun learning how to work snd transform photos on photoshop! Well said. After being in graphic arts for so many years I too have used similar techniques to make text stand out until know it is just second nature. Contrast, drop shadow, emboss, and stroke are some of my favorite tools. Also, highlight when i have a pretty busy background. Oh how I wish I have the time now. I would love to learn this. Definitely I will refer to this article once I have extra time. Thanks Don Charisma! 😀 it’ll be here when you’re ready … you’re welcome ! I wouldnt suggest using a drop shadow for a website though. I dont know, seems like an old look to me. 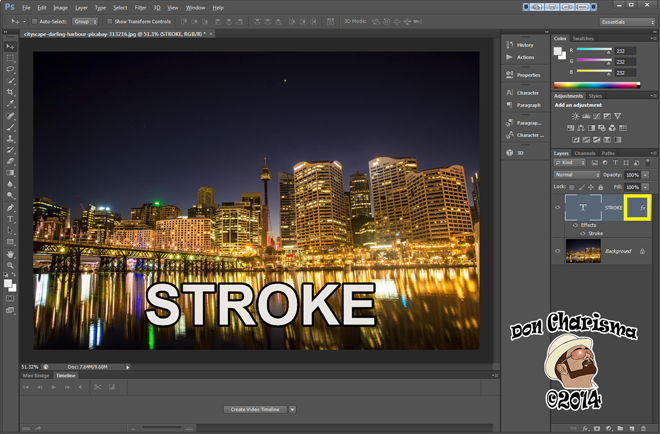 Stroke and overlay look much more clean, much more professional (and its what I use anyways-that and contrasting). If one wants to follow current trends in flat design, then I’d agree. However this wasn’t a post specifically about web design. My overall idea was to convey (easy) techniques to increase text’s readability, fashion wasn’t part of the equation (well not that much!). Also my posts stick around on Google for months/years, and as fashion changes nearly as often as people change their underwear, for me it’s fair to include the technique. Today’s flat design is tomorrow’s 3d with drop shadows. Just as today’s single breasted suit is tomorrow’s double breasted suit. Ha, you’re indeed correct. Although i don’t suppose this minimalist design era will phase out soon…it definitely will eventually. You’re probably right on that too, flat design will have it’s day, until the next trend arrives … maybe it’ll be all drop shadows, or might be all outer glows … who knows ! Next Next post: If we are to achieve results never before accomplished, we must expect to employ methods never before attempted.